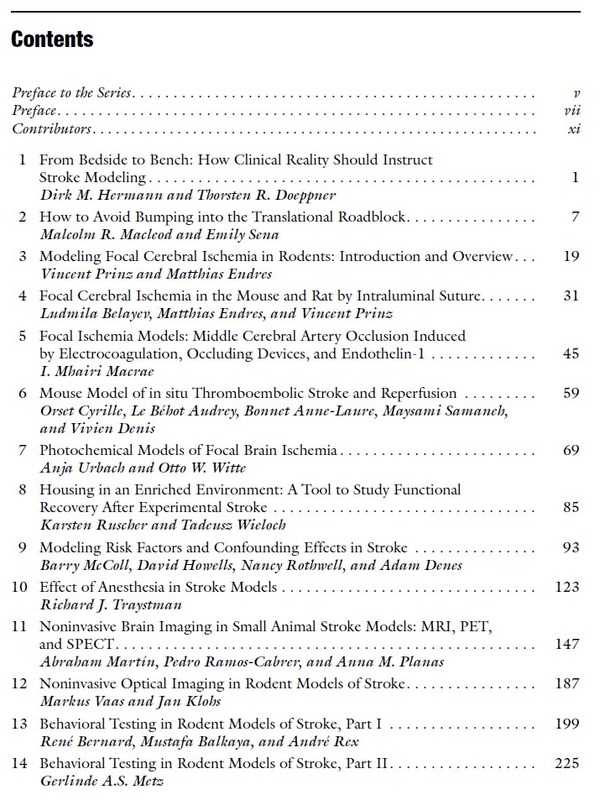 Hot off the press: 2nd Edition ‘Rodent Models of Stroke’ | To infinity, and beyond! From the preface: Despite major advances in prevention, acute treatment, and rehabilitation, stroke remains a major burden on patients, relatives, and economies. The role and potential benefits of experimental models of stroke (i.e. focal cerebral ischemia) in rodents have been recently debated. Critics argue that numerous treatment strategies have been tested successfully in models only to be proven dismal failures when tested in controlled clinical trials. When methods of systematic review and metaanalysis are applied, however, it turns out that experimental models actually did faithfully predict the negative outcomes of clinical trials. For example, thrombolysis with tissue plasminogen activator (t-PA), the only clinically effective pharmacological treatment of acute ischemic stroke, was first demonstrated and evaluated in an experimental model of stroke. Many other examples document the positive prediction of rodent stroke models even beyond the brain, such as changes in the immune system and susceptibility to infection after stroke. These were first described and can be faithfully modeled in rodents. Beyond its role in investigating pathomechanisms of stroke and in preclinical testing for the efficacy of novel diagnostic and treatment strategies, rodent stroke is often used as a ”model” for how the brain reacts to neurological injury (damage, protection, repair), with implications for many other neurological disorders such as brain and spinal cord injury, epilepsy, and even multiple sclerosis. Concepts such as ”neuroprotection”, ”preconditioning”, ”ischemic penumbra” are largely the result of experimental stroke research. Nevertheless, the issue of the relevance of experimental stroke research, in particular in rodents, to human disease, has to be taken seriously. A number of problems have been identified which are prevalent in this research field and impact on its predictiveness. These include low statistical power, deficiencies in experimental design, analysis, and reporting, as well as publication bias, just to name a few. In addition, the validity of experimental stroke research is affected when the effects of age, gender, and comorbidities are ignored in modelling of stroke. The first edition of this volume was well received by the stroke research community. 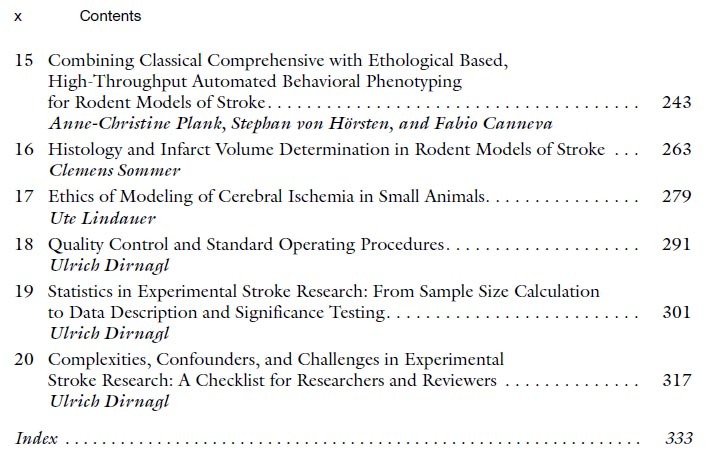 In this second edition, our international consortium of authors updated and expanded their comprehensive, critical, and very application-oriented approach to the toolbox of rodent models of stroke. From choosing the model and outcome measures, designing the experiment, conducting and analyzing it, to reporting it in a scientific publication, we are offering food for thought as well as practical advice. This book is the result of longstanding cooperation of many of the authors, not only scientific, but also in teaching animal models of stroke and good scientific practice to students and researchers. It is also the result of an intense discussion of issues of validity, quality and its control. For more than fifteen years several of the authors have been organizing the international course ‘Methods in Cerebral Ischemia Research’, and many are jointly organizing training and dissemination of practical knowledge in European Community-funded initiatives such as the European Stroke Network or Multi-PART (Multicentre Preclinical Animal Research Team), as well as in the Center for Stroke Research in Berlin. The structure and content of the book reflect both the authors’ longstanding expertise in experimental and clinical stroke research and their roles in training the scientific community in the tools of the trade. 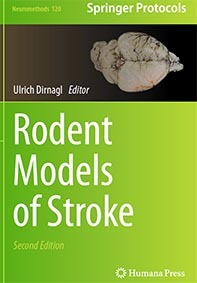 We hope that this updated second edition will help its readers understand the limitations and the opportunities of modeling stroke in rodents and enable them to conduct experiments which will not only improve our understanding of the pathophysiology of this devastating disorder, but also serve as the basis for developing highly effective treatment. 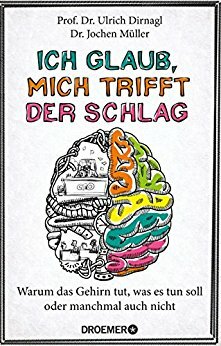 Ich glaub mich trifft der Schlag….